Part III: In which our hero makes his way to America, helped by a long string of strangers along the way; finally finds work as a master tailor at Marshall Fields; and then meets Anna, the love of his life . . .
Alek Kozel’s first step in attempting to achieve his new goal was to go to the American embassy in Prague. He showed them his crumpled, tattered American birth certificate, but they informed him, after careful inspection of it, that it was too torn and illegible to be used and that he would have to send away for a new copy. Not to be deterred, Alek wrote a letter to St. Andrew’s, the Catholic church in Christopher, Illinois, where he had been born, to obtain a new copy of his birth certificate, a task he accomplished with the help of an acquaintance in Prague, one Frank Svoboda, who knew how to read and write in English. Alek waited months for a reply, which finally came in the form of a letter from one Donald Novotny. Donald Novotny was apparently a very prominent Czech living in Christopher, Illinois who had been given Alek’s letter by the pastor of St. Andrew’s. In his letter, Mr. Novotny explained to Alek that the church had burned down several years before and that all the church records had been destroyed. Mr. Novotny, however, vowed to help Alek to obtain a new birth certificate and had indeed already started the process, but informed Alek that it might take a very long time. As promised, though, after eight months of waiting, the new birth certificate finally arrived along with a letter from Donald Novotny explaining that he had had to track down Alek’s godmother, whom he found living in Indiana, to sign a document verifying his birth. Once found, however, she proved to be too old and crippled to sign, so her son had to then be located to sign for her. Also, Mr. Novotny explained, he had applied to the United States Government to become Alek’s sponsor and had been approved, so all was in order for him to finally come. Overjoyed, Alek then hurried to the embassy in Prague to obtain his visa to leave and began his preparations for his new life in America. Before he left, he went to say goodbye to his old employer, Mr. Navratil, and to the old woman he had lived with, Mrs. Dubala. He had a little farewell gathering at the pub he used to go to and there said goodbye to Dusan, Evzen, and his friend, the policeman, among others. Sadly, Mr. Skalicky had already passed away. It was at his farewell party that two sisters living in that same town asked him if he would carry some packages and letters to their sister, one Tamara Fiala, who was living in Chicago. Alek agreed, and the two sisters ran home to get the packages and a little card with their sister’s address written on it. Alek also went and said a last goodbye to all of the people working in the food ticket office, many of whom he had gotten to know so well over the years. They then told him that they had known all along that his employment notes from the farms had been falsified, but that they had given him the tickets anyway. They liked him very much, they told him. He was a smart man and a good talker, and though they would miss him, they wished him well. Alek was informed that he could have immediate passage on a cattle ship, but he wanted to wait for a regular passenger ship, even though there wasn’t one leaving for another three weeks from Le Havre, France. Alek decided to spend his last weeks hanging about Prague until closer to the date of departure, sleeping outside and getting what food he could. It was during this short, three-week period that Alek happened to meet a young woman, Bessie Beranek, who was working as a waitress in a café. She had been married to a German who had died in the war, and Alek fell madly in love with her, the first woman he had ever fallen for. He spontaneously asked her to marry him and come with him to America. She said she would, but she had no money and Alek had only enough for his own passage. He promised to send for her once he got settled and had earned some money, and so they sadly said goodbye when it was time for him to take the train to Paris and then on to Le Havre to board the ship. For a long time after, Alek continued to write to her from America and to send her gifts—things she wouldn’t be able to readily get in Europe at the time, he said—such as a bathing suit or a beach towel. Eventually, however, her letters stopped coming, and Alek finally gave up hope of them ever being together. Once on board the ship that was to carry him away from war-torn Europe and toward his new life in America, he met a Yugoslavian man who could speak English very well and who was bound for Canada. He took an instant liking to Alek and helped him in many ways. For example, when the ship finally docked, there was an announcement for all Americans to disembark first. The Yugoslavian interpreted the message for Alek and prodded him to go, since he had American papers. Alek followed the man’s directions, but the ship officials tried to stop him because he couldn’t speak English. The Yugoslavian man stuck up for him, though, and they eventually let Alek through. Not knowing where to go first, Alek sat and waited for the Yugoslavian man to disembark, which took a long time as he had a big crate of gifts that the officials insisted on rifling through. Surprised to still see Alek sitting there with his little case once he finally disembarked as well, the man bought him some dinner and then took him to the train station and bought him a ticket for Chicago. Alek asked for his address where he could send money to repay him, but the man refused. Once on the train bound for Chicago, Alek was again fortunate in meeting a friendly stranger who helped him. The man only spoke English, but he bought Alek some food and a pillow and tried to find someone on the train who could speak Bohemian. Finding no one, however, the man tried his best to communicate with Alek himself. Once they arrived in Chicago, Alek showed him the address of Tamara Fiala. The man seemed to understand and put him in a cab, gave the address to the cab driver and paid Alek’s fare for him. When the cab finally pulled up to the building indicated on the card, the cab driver helped Alek find the right apartment, banged on the door and yelled, “Hey! You got someone from Europe here!” The woman who opened the door was not Tamara Fiala, however, but instead was Mrs. Fiala’s daughter and her husband. They took Alek in, however, and gave him a much-needed bath and one of the husband’s t-shirts—several sizes too big—to wear for the night. The next day, they took him to Berwyn, where Mrs. Fiala was living, and Alek was able to finally deliver all the little packages from her sisters that he had been carefully carrying this whole journey. Mrs. Fiala promptly took Alek in, overjoyed to see someone from her old town, and collected money from the Czech community in Berwyn to pay for his train ticket to Christopher, Illinois, where Donald Novotny was supposedly waiting to collect him. Once procured, Mrs. Fiala pinned the ticket to his lapel, explained his situation to the train conductor and asked him for his help in getting Alek to his destination. The conductor willingly agreed and and thus accordingly told Alek when to get off. As promised, when Alek descended from the train, there was his sponsor, Donald Novotny, waiting to take him to Christopher, Illinois, fourteen miles away, the very place he had been born back in 1913. Though none of it looked familiar, Alek admits that he cried, so overcome with emotion was he. Mr. Novotny was very kind to him and took him in to live with him and his wife. They put him in their guest bedroom and gave him a bath, and then Donald promptly took him to get a hair cut and out to dinner to a restaurant, where Alek ordered a strange delicacy—spaghetti and meatballs. Donald introduced him to the Czech community in Christopher, many of whom either remembered his parents or recognized the Kozel name. They took turns having him to dinner, washing his clothes for him and attempting to teach him some English. Alek was comfortable in his new surroundings, but after a while he began to realize that he had no prospects. Likewise, it seemed that things were getting a little tense with the Novotny’s. Indeed, one day, Donald’s wife, who worked at a local tavern, exploded in fury when she discovered that the money she was giving Donald to supposedly give to Alek was actually going to Donald’s mistress. Alek tried to steer clear of the Novotny’s domestic troubles, but it was difficult since he was living in their house. As it turned out, a Yugoslavian woman living in Chicago happened to show up just as all the trouble was brewing, to collect her husband’s pension check. Donald Novotny was somehow involved in the pensions of the mine workers in Christopher. This woman’s husband had been badly burned in the mine, and she did not trust the mail system; therefore, she came and collected his checks in person. Donald introduced her to Alek, and when she had heard his whole story, she invited him to come and stay with another Yugoslavian family she knew of in Chicago. As his official sponsor, Donald was hesitant to let Alek go to such a big city as Chicago to live and work, but after much thought, especially considering the marital troubles he was now having, it seemed to make the most sense. So, back Alek went to Chicago to stay with the Yugoslavian family. The family had two sons, the younger of whom, Ivan, especially befriended Alek. The two of them would sit outdoors in the evening, and Ivan would try to teach Alek bits of English. Alek was surprised and delighted to learn that Ivan was interested in becoming a tailor, but he attempted to talk him out of pursuing such a career, telling him that the pay was no good. Ivan decided to listen to his new friend and eventually chose a different path, but he did take Alek to Marshall Fields to inquire about a job for Alek in the tailoring department. As it turned out, the foreman of the tailoring department at Fields at the was a Bohemian man as well, and he agreed to give Alek a try. Within a couple of months, Alek was recognized as the best tailor in the department— perhaps the best tailor they had ever had! Alek had been hired at fifty-five dollars a week, but when he found that everyone else was making sixty-five a week, he demanded a raise. He didn’t care if he was fired, as he didn’t have any dependents and he knew he could get a job doing just about anything. The foreman agreed, though, and Alek continued working at Marshall Fields for the next twenty-seven years. For Alek, this was indeed the pinnacle of his career, the position it seemed he had been training for and working at for years and years while still in Europe. He was immensely proud of his position at Marshall Fields, and accordingly, he thought it essential that he dress the part. Each day, then, he would come to work dressed in a fine suit, tie and hat just as any business man would go to work in. Once at Fields, he would change into his work clothes, but then would change back into his suit for his trip home. Alek only stayed with the Yugoslavian family for a short time. After only three weeks, the mother of the family felt it to be a strain to not only feed and care for her own two sons but Alek as well, so she asked her husband to find another place for Alek to live. The husband appealed to a Slovak friend of his who agreed to rent him a room for a year. After that first year, Alek then rented a room from the man’s mother, who lived in Cicero, which meant Alek had to commute to Marshall Fields from Cicero each day. Alek didn’t mind living in Cicero, however, as there was a huge Czech community there, and he felt at home. Now that he had a place to live and a great job, he decided to try to socialize more and meet some new friends and so joined many Czech clubs and fraternal organizations. It was at one such club that he met a woman named Anna Hajek, the same given name as his mother. The club was having a dance once night, and after catching his eye from afar, Anna approached him and asked him to dance. Alek was taken aback by her forwardness, but he accepted and then spent the rest of the night talking with her. He escorted her home, chivalrously paying her fare on the El for her, where she lived alone with her mother, she told him. Alek and Anna enjoyed talking so much that Alek asked her out on a date for the following Saturday, and she accepted. There was an immediate spark between them, and they began to see each other more and more. Alek was mesmerized by Anna, and he quickly fell in love with her. He was shocked and outraged, then, when one day he showed up at Anna’s house in Cicero, only to find a young man in the house with her. His old temper flaring, he demanded to know who the man was. Anna quickly explained that the young man was actually her son, William! She then explained that she had gotten pregnant with William when she was only fifteen. She refused to talk about the circumstances, merely saying that she never saw the father again, and that she and her mother had raised William on their own. A few years after William’s birth, Anna explained that she had met another man, one Mike Kennedy, whom she fell in love with and assumed she would marry. When she got pregnant, however, Mike deserted her. After she had the baby, whom she named Robert, Mike unexpectedly showed up again, took Robert and gave him to his mother to care for. Anna grieved for her baby, but she felt she had few options, especially as she needed to continue working to support her aging mother and little William. Over the years, she told Alek, friends had told her that she should fight to get Robert back, but though she missed him, she wasn’t sure her mother could care for another child anyway. Her mother had several health problems as it was, and from a young age, William was actually more a caregiver to her than the other way around. Sadly, Anna explained that though Robert was now fifteen, she barely knew him and only usually saw him at the holidays, as Mike made it very difficult for her to be involved in his life in any way. William, meanwhile, at age nineteen, was off at college now and was merely home at the moment for a visit. She had planned on telling Alek everything, she told him, just that she had been waiting for the right moment, afraid that if she revealed too much, she would scare him away. Alek, it seems, was a little thrown off by all of this and took a couple of weeks away from Anna to absorb it all. Initially, he felt deceived by her, but in the end, he realized that he was acting stupidly. After all, he hadn’t shared all of the details of his life yet, either, he reasoned, including his “affair” with Bessie Beranek. He loved, Anna, he decided, and didn’t want to lose her. Thus, instead of breaking it off with her, he proposed to her, and she accepted. Alek was thirty-eight years old at the time, though he felt he had already lived many lives. Anna, too, at age thirty-four, had been through much. They had both been in love before, but this was the first marriage for both of them, and they very much felt that they were beginning a new chapter and starting yet another new life, this time together. They married in 1951, and one of Anna’s friends had a little reception for them at her home. Alek says it was a small affair, but they had a nice dinner, beer, whiskey and a cake. They sold the house in Cicero and rented an apartment in Berwyn, another big Czech community, and naturally brought Anna’s mother to live with them. After only a year of working hard, they saved one thousand dollars, enough to put down to buy a dry-cleaners on Euclid in Berwyn and moved into the apartment above it. Anna ran the dry-cleaning business while Alek still worked at Marshall Field all day. Alek and Anna never had any children, but after only a year or so of marriage, a child came to them in a different way. On their second Christmas together, Anna’s son, William, showed up unexpectedly at their apartment with his two-and-a-half year old daughter, Evelyn. Right at about the same time that Alek had entered the scene, William had married a young woman named Ruth Herbst, whom he had met at college. Neither Anna nor her mother had a good feeling about Ruth and tried to warn William, but he had married her anyway, saying that a baby was on the way, and he didn’t want to repeat the mistakes made by his own father and his brother’s father, Mike Kennedy, by having the baby born out of wedlock. Shortly after Evelyn was born, however, Ruth demanded that they move to California to be near her family, so William reluctantly agreed. He got a job there and continued trying to get his college degree at night. William explained to his mother and Alek that he soon discovered that Ruth was leaving the baby alone during the day while she went out. He suspected her of having an affair, so he hired a detective, who soon produced the evidence confirming William’s suspicions. William divorced her and hired a babysitter to watch little Evelyn, who was now a toddler. William then discovered that the babysitter and her husband were severely punishing Evelyn for wetting her pants, which was the last straw for William. In desperation, he packed Evelyn up and went back to Chicago, arriving the day after Christmas to appeal to his mother and Alek for help. He was desperate, he explained, and begged Anna and Alek to take Evelyn in while he finished his degree. Anna was hesitant to do so, but Alek was captivated by Evelyn and convinced Anna to care for her. Thus, Alek and Anna began a little family together, both of them adoring Evelyn. They gave up the dry-cleaning shop after only a couple of years because it failed to make any money, so they moved to an apartment on Springfield Street in Berwyn, where they stayed for nine years before they moved again to Avery Avenue. 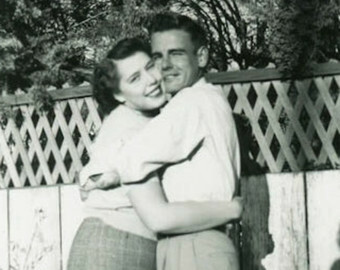 After only about a year of Evelyn being with them, William remarried in California, but neither he nor his new wife showed any interest in coming to get Evelyn. Thus, Evelyn remained and grew up with Anna and Alek, whom she called her grandma and grandpa, for the next twelve years. Alek continued working at Marshall Fields, and Anna, for the first time in her life, stayed at home as a housewife to care for Evelyn as well as her mother, who unfortunately died not long after. When Evelyn turned fourteen, William again appeared at Christmas time to visit, the first time he had done so in several years. Evelyn was enraptured with her father, and though she loved Anna and Alek, she begged him to take her to California so that she could meet her step-mother and her three half-brothers. William reluctantly agreed, much to the utter heart-break of Anna and Alek. They only wanted the best for Evelyn, but they were utterly crushed when she left and missed her terribly. Nothing was the same after she left, Alek explains, though she wrote to them faithfully. But Evelyn was not their only source of sorrow over the years. One other reason that Anna quit working when Evelyn came to live with them is because she had been diagnosed with cancer in 1955. She received extensive treatments, and the cancer went into remission, though it left her extremely ill at times. Even after Evelyn left, Anna did not go back to work and remained at home. Alek began planning their retirement very early on and over the years had saved enough to buy a little parcel of land and a trailer in New Concord, Kentucky. By 1976, he was ready to retire, but his foreman at Marshall Fields asked him to stay on for one more year. Alek discussed this proposal with Anna, but she told him that if she had to wait another whole year, she wouldn’t make the move at all. Thus, Alek gave up his position of master tailor at Marshall Field, and they moved to New Concord. They had several years there together and enjoyed puttering about with different hobbies and made new friends. They were truly happy, Alek says, despite everything that had happened to them over the years. Only once did Alek ever hear from the family he fled from in Czechoslovakia. In 1978, he received a letter from a younger sister who had been born after he had run away. This sister informed him that their father had died years ago and implored Alek to return home to visit their mother one last time, as she was old and blind and sick and was asking for him. Anna told him that he should go, but Alek instead threw the letter into the fire and never saw or heard from any of them again. Unfortunately, in 1984, Anna’s cancer came back with a vengeance. She again took up the battle to fight it, but on April 13, 1989, she finally died. Alek was devastated by Anna’s death and for many, many months had trouble sleeping. He would awake in the middle of the night and, unable to get back to sleep, would get up and work on the trailer, fixing things inside and out. He ran himself ragged to escape his sadness, and on December 12, 1993, he suffered a stroke and was taken to a hospital in Murray, Kentucky and then transferred to Lourdes Hospital in Paducah. From there he was transferred for some reason to a rehab center in Marion, Illinois, very near the Kentucky boarder and, in an ironic twist of fate, not far from Christopher, Illinois, where he had been born, completing a nearly eighty-year journey around the world and back. At the nursing home in Marion, Alek made little progress toward his rehabilitation and remained in a deep depression. The social service staff were eventually able to locate and reach out to his step-sons: William, still living in California, and Robert, still living in Chicago. The two half-brothers then eventually came together and found a Bohemian nursing home in Chicago where they thought Alek might be happier. They arranged for the transfer to the nursing home and were both on site when he arrived at his new home. He was grateful and happy to see them both, but he lives in hope that Evelyn might some day visit, though she is living with her husband and children in California. So far, Alek seems to be making a fairly good transition to the new facility. He enjoys being able to talk to people in Bohemian, though the stroke has affected his ability to speak clearly. This frustrates and angers him, as he has a lot to say and wishes to tell anyone who will listen his long, long story. Most people cannot understand him, though, as he slurs his words a lot and drools constantly. He participates in some activities but prefers to talk to the staff. He is very pleasant and courteous, though he always seems to have a bit of a chip on his shoulder. He sees himself as a victim of life’s misfortunes in many ways, despite having thwarted life’s curve balls so many times. He seems desperate to tell his epic adventures and loves to tell about his work at Marshal Fields in particular, which seems, in his mind, to be his crowning achievement, though the love of his life, he says, was, and always will be, Anna. These people lived horrible lives, but they seem to be happy. Thank you for these stories……. They really did, didn’t they? Can’t believe what this man went through. So inspiring! Thanks for reading, Alan! This is so very interesting. It’s hard to believe what a complicated and varied life he lived. What a trouper! Yes, he was, wasn’t he?! Such an amazing life. Thanks for reading! I agree, Gabriel! So hard to believe that after all those years, he still had such bitterness towards his family. I think he must have really suffered. Yes! Amazing, isn’t it? Thank you for reading!